Valve Software finally confirmed that the Steam Machine game consoles built by its hardware partners will include AMD graphics chips. Prototypes of Valve’s Steam Machine consoles, announced last week, will use Intel CPUs and graphics chips made by Nvidia. But a spokesman for Valve Software said in an emailed statement that future designs will use AMD graphics, as well. The company did not respond to requests for comment last Friday. The spokesman did not say, however, whether or not the Steam Machines would actually use AMD’s microprocessors, generally considered to be slower than Intel’s own. The opposite is true of AMD’s graphics chips, however. 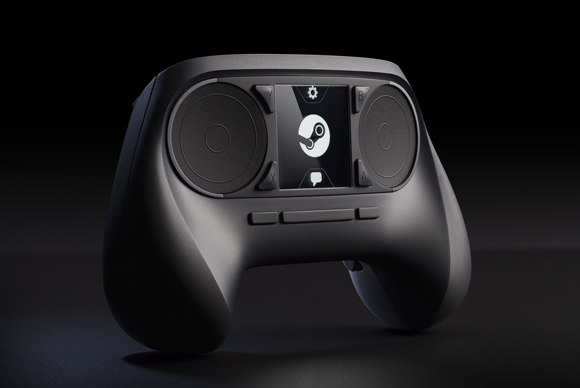 Valve’s Steam Controller will be used with the Steam Machines. Some have characterized Valve’s Steam Machines as an end run around the Windows PC as a gaming platform. True or not, Valve’s Steam service is arguably the most influential medium of games distribution in gaming. The Steam Machines are Valve’s attempt to move its influence from the PC to the console. With the release of 300 prototypes, varying significantly in their hardware capabilities, Valve has set the stage for a series of gaming-optimized, PC-like boxes to compete with Windows with Valve’s own Linux-based Steam OS. AMD’s seeming exclusion last week was worthy of note, if only because of AMD’s strong presence in the graphics market, as well as the wide variation of the Steam Machine offerings. AMD is the largest GPU vendor besides Intel. Intel's dominant market share in the CPU market (and whose Core chips integrate graphics hardware) have pushed it to a 62 percent market share, according to Jon Peddie Research. AMD is next with a 21.9 percent share, followed by Nvidia at 16.1 percent. On Wednesday, AMD also responded to the question whether it had been excluded from the Steam Machine program. “This couldn’t be further from the truth—AMD is very actively engaged with Valve on these products and campaigns,” a spokesman said. The Steam Machines themselves will measure 12 inches by 12 inches by 2.9 inches, and contain a 450-watt power supply, Valve has said.